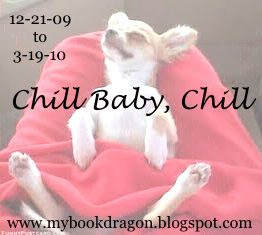 Book Dragon's lair: Chill Baby, Chill! Yea, yea, yea, I know, it isn't even Fall yet. I wanted a winter challenge and I can't add another book to my list! This seemed like the perfect alternative. 1. Comment here with a link to your POST about the challenge - I'll get a participant list going. 4. Just relax - read whatever you'd like or use this time to catch up on challenge books. I guess I am first to join. I have posted this challenge to my blog, and hope it attracts readers. Thank you for this challenge it looks fun! I would love to join this challenge. The button is too darn cute not to! Thanks for hosting! I'd love to join this challenge. Have been unwell for a while but will get a post up as soon as I can. the picture is too cute. I love to chill with a blanket and read. So I am in for this challenge. I should be able to read 6 between 12-21 and the end of the year. I probably ownt do book reviews nexst year, waste of time. Gina -- thanks for hosting this challenge. Looking forward to reading/listening to books & posting a review even if it's mostly from the back of the book! Count me in this one! I will post about it a little later....must get to bed! Please sign me up! Will link later. My Chill Baby, Chill is complete. I had a lot of fun. I couldn't take my eyes off of the chihuahua. He kept me going. Don't worry about my link. Something is wrong with it. I will work on it more this weekend. Sorry to cause confusion. Here is my link. I have completed Chill Baby Chill challenge. Thanks for giving the challenge. Sorry I'm late completing my wrap-up. You will see I completed before the date though. Thanks for hosting. Hope to come back to it next year!